- Mid-South Superdome Extravaganza (November 26, '81) = The Iron Sheik defeated King Cobra. - NJPW 5th Annual MSG League (March/April '82) = The Iron Sheik competed in the league, which was won by Andre the Giant. - WWC 10th Anniversary Show (September 17, '83) = The Iron Sheik was pinned by Hercules Ayala. - WWF Madison Square Garden Show (December 26, '83) = The Iron Sheik won the WWF World Title, forcing Bob Backlund to submit. - WWF Madison Square Garden Show (January 23, '84) = The Iron Sheik lost the WWF World belt to Hulk Hogan. - WWF Brawl To End It All (July 23, '84) = The Iron Sheik defeated Tony Garea. Later that night, the Iron Sheik competed in a "Battle Royal", which was won by Antonio Inoki. - WWF Wrestlemania I (March 31, '85) = The Iron Sheik & Nikolai Volkoff won the WWF Tag Titles, beating the US Express. - WWF Saturday Night's Main Event #1 (May 10, '85) = The Iron Sheik, Nikolai Volkoff & George Steele fell to Ricky Steamboat & the US Express. - WWF Ohio State Fair Show '85 (August 13) = The Iron Sheik lost to Paul Orndorff. - WWF Michigan State Fair Show (August 28, '85) = The Iron Sheik & Nikolai Volkoff were beaten by the British Bulldogs. - WWF Wrestling Classic (November 7, '85) = The Iron Sheik lost to the Junkyard Dog. - WWF Wrestlemania II (April 5, 86) = The Iron Sheik competed in the "NFL/WWF Battle Royal", which was won by Andre the Giant. - WWF Saturday Night's Main Event #6 (May 1, '86) = The Iron Sheik & Nikolai Volkoff lost a "Three Falls" Match to the WWF Tag Champs, the British Bulldogs. - WWF Saturday Night's Main Event #10 (February 21, '87) = The Iron Sheik was pinned by Ricky Steamboat. - WWF Wrestlemania III (March 29, '87) = The Iron Sheik & Nikolai Volkoff won, via DQ, over the Killer Bees. - WWF Saturday Night's Main Event #11 (April 28, '87) = The Iron Sheik & Nikolai Volkoff fell to Rick Martel & Tom Zenk. - WWC 14th Anniversary Show (September 20, '87) = The Iron Sheik lost to Tony Atlas. - WCCW Thanksgiving Star Wars '87 (November 26) = The Iron Sheik & the Thing lost, via DQ, to Chris Adams & Matt Borne. - WCCW Christmas Star Wars '87 (December 25) = The Iron Sheik fell to the WCCW Texas Champ, Matt Borne. 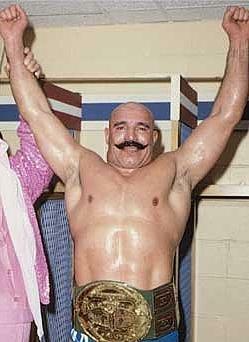 - WWC 15th Anniversary Show (September 10, '88) = The Iron Sheik was beaten by Ron Garvin. - NWA Clash of the Champions VI (April 2, '89) = The Iron Sheik lost, via DQ, to Ranger Ross. - NWA Wrestlewar '89 (May 7) = The Iron Sheik was beaten by the NWA Television Champ, Sting. - NWA Great American Bash '90 (July 7) = The Iron Sheik fell to Mike Rotunda. - UWFI Budokan Hall (October 23, '92) = Khasrow Vaziri lost to Yoji Antoh. - Heroes of Wrestling (October 10, '99) = The Iron Sheik & Nikolai Volkoff fell to the Bushwhackers. - WWF Wrestlemania X-7 (April 1, '01) = The Iron Sheik won a "Gimmick Battle Royal".